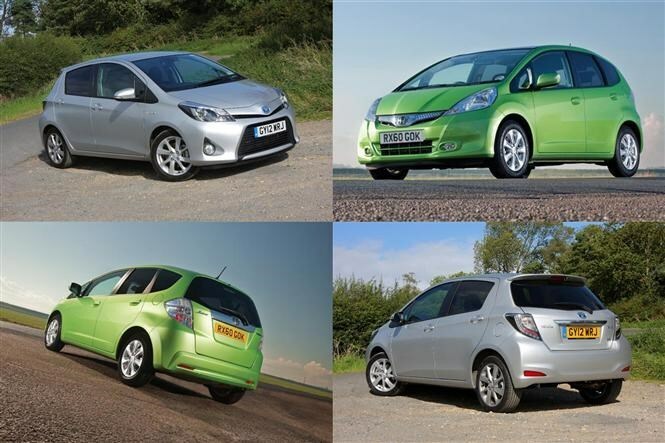 With so many mid-size hybrid hatchbacks already on the scene, and the more recent addition of the petrol-and-battery-powered SUV, it can be easy to overlook the thriving market for hybrid runabouts. While not quite as compact as the tiny Smart Fortwo or VW Up, both of these superminis pack serious practicality into a compact footprint, while offering diesel-aping fuel economy and CO2 emissions. Our Cars for Sale section shows the latest deals on these cars if any take your fancy. And when you decide to sell your current car, make sure you get a free car valuation to ensure you get the right price. Toyota Yaris: The hybrid powertrain here uses a 1.5-litre petrol engine and electric motor to produce 100hp, enough for a 0-62mph time of 11.4 seconds. This system is more tuned for economy than performance, though, so don’t expect smoking starts from the lights. It’s very easy to drive around town – partly because, unusually for a supermini, the Yaris features an automatic gearbox like other hybrids – but enthusiasts might feel a little short-changed on a windy B-road. Honda Jazz: Supplementing the petrol engine is an electric motor, and in tandem the powertrain delivers 101hp. This doesn’t translate into a record-breaking 0-62mph sprint, though, as it requires 11.7 seconds, but it’s considerably quicker than the conventionally-fuelled Jazz. The automatic transmission dulls perfomance, however. Toyota Yaris: This Yaris is a little longer than the old one and that means more interior space, but it’s not exactly massive inside, with a smaller boot than some of its competitors. If you’re only pottering around town that probably isn’t a massive concern but worth considering when you go for a test drive, so make sure you bring child seats or golf clubs or other essentials. Honda Jazz: Although it’s a small car, the Jazz offers very good practicality thanks to the clever way it has been packaged. You get a large boot and a big glovebox, with Honda's Magic rear seats that flip and fold in clever ways, making a flat floor for even more storage. Handling prioritises safety over enjoyment, so expect high comfort levels but not much driver involvement. Toyota Yaris: Road tax won’t cost you a penny thanks to super-low CO2 emissions, plus you won’t see much of your local petrol station with claimed fuel economy of 85mpg. This is obviously a figure obtained in laboratory conditions rather than a realistic target but still, if you can get anywhere near it with careful driving then you’ll be using a small amount of fuel. Honda Jazz: CO2 emissions just over the 100g/km mark mean you don’t qualify for free road tax, but it’s certainly not expensive, with a £10 annual bill. Claimed fuel economy of 62mpg isn’t too shabby either – it’s on a par with a small diesel hatchback. As with the Yaris though, it’s best to use this as an aspirational guide rather than an expected fuel economy. Honda Jazz: It’s a tough call this month with good and bad on both sides, but we think the low running costs (admittedly higher than the Yaris), enhanced practicality and under-the-radar looks of the Jazz make it a better all-rounder. Toyota Yaris: It's a convincing package with much more modern looks than the Honda, plus slightly more sprightly performance in the 0-62mph sprint and lower running costs. That said, it’s not as practical inside and because it’s a newer car, can’t be picked up for bargain prices like the older Jazz. Still need help deciding what to go for?